We’ve all seen it happening in the last few years. Military training is continually being transformed by technologies more popularly associated with entertaining teenagers lounging in the basement playroom than honing the skills of soldiers in dusty combat training grounds. In fact, the training ground as we know is getting a major remodeling as well. But first, I’d like to tell you that for this issue, we’re featuring the first installment of a two-part special interview with Gen. Jonathan Vance, chief of the defence staff. In this one-on-one talk with Michel Maisonneuve, the CDS discusses the importance of adjusting the military’s personnel policies to meet the demands of the present milieu and comes out revealing how he deeply cares for the career development of each military personnel. 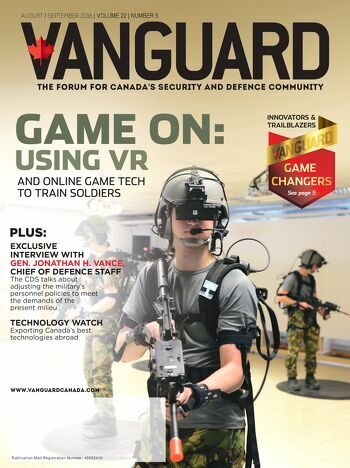 In this issue, Vanguard also looks at some of the technologies that are altering the way today’s soldiers train for the conflicts they will face tomorrow. Our regular Dashboard section takes a pictographic look at the growing potential of the simulation-based military training market and the trends making the most impact in that space. We also have a feature on how CAE is leveraging live-virtual-constructive simulation for its aerospace and navy training systems. Our story on Bluedrop delves into how virtual reality and gaming technologies are increasingly finding their way into military training. One of our Game Changers for this issue, Scott Davis, is CEO and co-founder of RaceRocks 3D Inc. The Victoria, B.C.-based RaceRocks relies on its media and gaming expertise to provide learning services and solutions for the Royal Canadian Navy. Speaking of Game Changers, you’ll find our profile on Ian Glenn quite engaging. Ian was a Canadian farm boy who became an officer in the Army and then later founded ING Robotic Aviation, an Ontario-based leader in delivering airborne sensing and surveillance solutions to private companies and the military. Also check out our profile on David “Jake” Jacobson, vice-president of defence support service provider Babcock Canada. 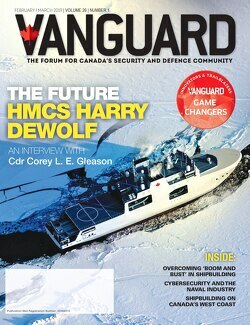 With the closing of the public consultation phase of the Defence Policy Review, Vanguard is also featuring some of the submissions presented by the Canadian Global Affairs Institute. Read up on Lt. Gen. (retd) Stuart Beare’s Defence Policy Review Considerations: Canada’s Army; David Perry’s Fixing Procurement; and Julian Lindley-French’s Making Canada’s Role in NATO More Effective. For Tech Watch, Nicole Verkindt, Vanguard technology editor; and Michael Petric, an associate at the global management consulting firm, Avascent, explore the exporting opportunities and challenges for Canadian defence companies. Finally, Nestor Arellano, Vanguard editor, talks to two former CSIS directors for their take on how Canada can boost its long-neglected cyber security posture. Is Embraer bracing to compete for FWSAR contract?